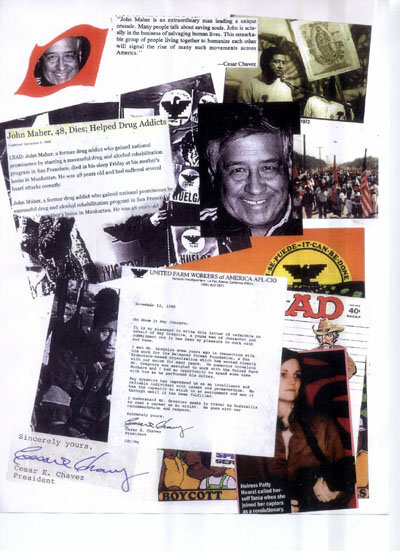 UFW Stories: "Breaking Cesar's Record"
During the “Thousand Mile March” in the summer of 1977, as a member of the Delancey Street Foundation, I worked as personal security for Cesar. Then at the end of the march, as security for the convention. One day while we were marching near Merced, California, we walked over 27 miles. That broke Cesar’s daily miles record. It also broke me! I was not accustomed to walking so much and the next morning at 4:00AM when we awoke, I was in so much pain I could barely move. So, instead of marching next to Cesar that day, I rode in the follow car. I was given a walkie talkie to be able to keep in touch with the security team. At intervals during the day, I gave weather reports, and other news tidbits, and even a song or two. The fellas told me later that Cesar got quite a kick out of my announcements. I remember also working a special security detail at the headquarters in Keene, California. We had received word from the FBI that an informant had witnessed a contact being put out on Cesar. We were deployed around the compound and on the surrounding hillsides with binoculars and walkie talkies. I suggested to Cesar that we put him in an Afro wig with dark sunglasses and a guitar and book him a flight as Bob Dylan to the Delancey Street facility in New Mexico. Cesar didn’t much care for that idea.